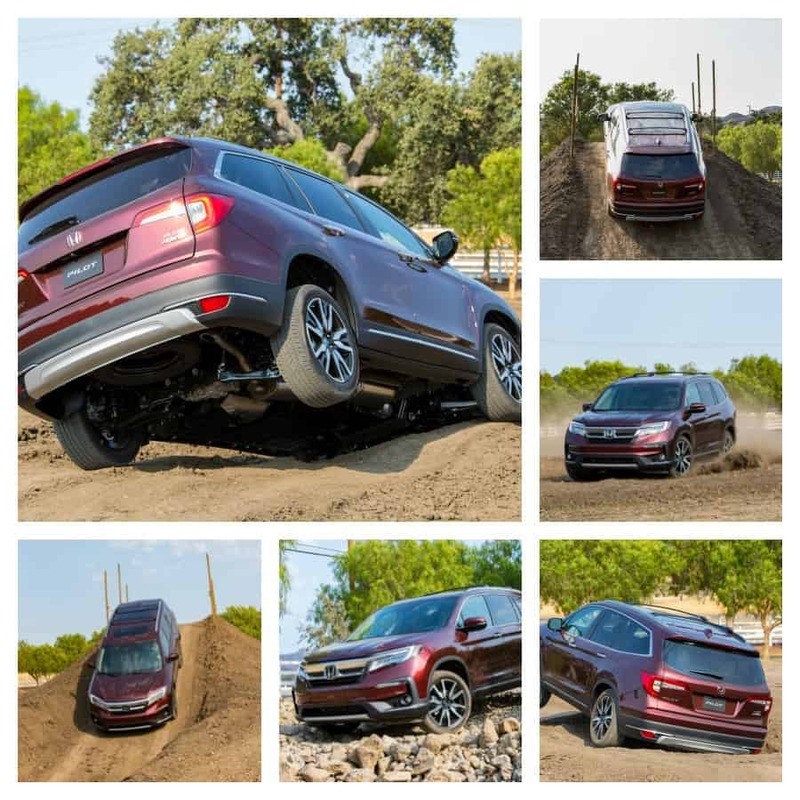 One of the most exciting things about the 2019 lineup of Pilots is that many high-end features have moved across the 5 trim levels, so at the lower price points you are getting standard bells and whistles. All Pilots have the same 3.5-liter V-6 engine under the hood – and it runs at 280 horsepower with 262 lb-ft of torque. I was just trying to be fancy there. 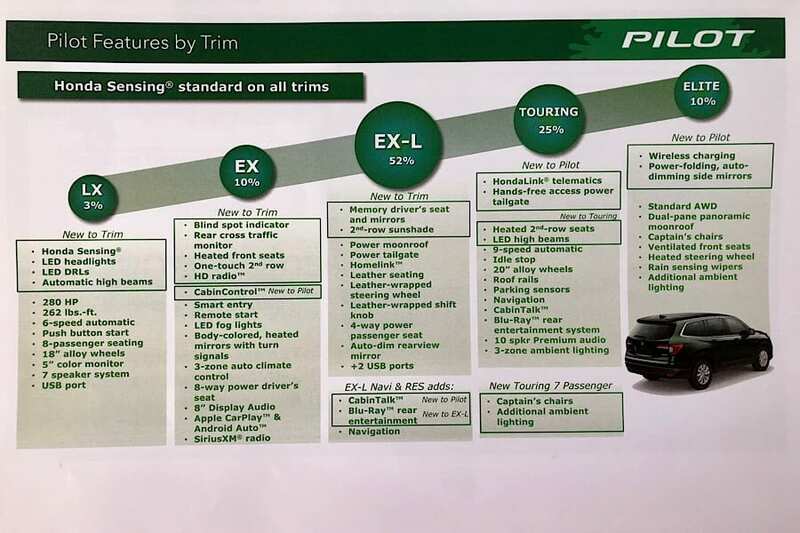 Basically, the Pilot goes like stink, and the top two models – the Touring and Elite – have 9 speeds instead of 6, so rapid speed changes are smoother. The LX, EX and EX-L models all start in second gear when you lightly tap the throttle, making for lots of power and smooth acceleration. 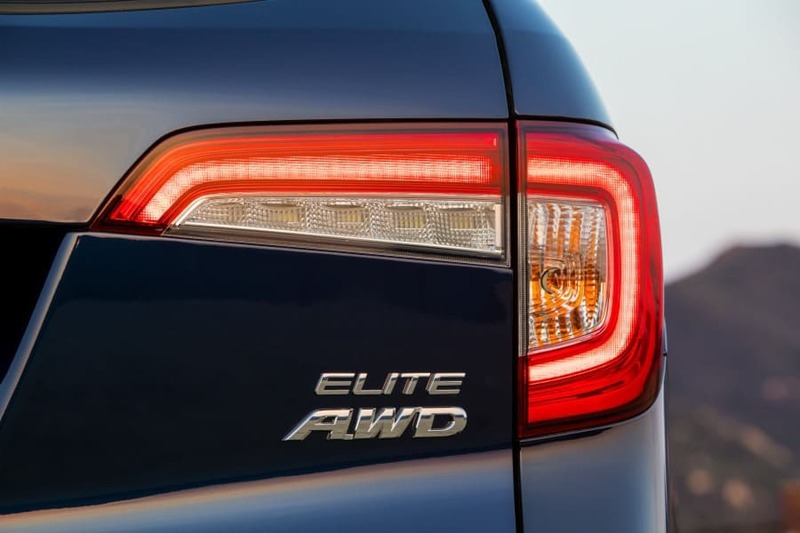 I drove the Elite model on steep, windy roads through California’s Aguora Hills and the sport mode and paddle shifters available with this trim level were super fun. You may want to stick to regular driving with screaming kids in the back, but using the paddles for even a few minutes ups your self-esteem and wannabe-spy aspirations. My insta stories are here if you want to take a peek at the fun! Collision Mitigation Braking System with Forward Collision Warning – aka: The car will automatically break when you spill coffee in your lap and are about to rear-end someone. Road Departure Mitigation – aka: The windshield camera keeps you on the road entirely instead of in ditches and shoulders. Lane Keeping Assist System – aka: If you start to veer off the road the car’s cameras will notice it is over the line and automatically steer you back into your lane. Adaptive Cruise Control – aka: When the bozo ahead of you slows down on the highway and your cruise is active, it will slow down as well. 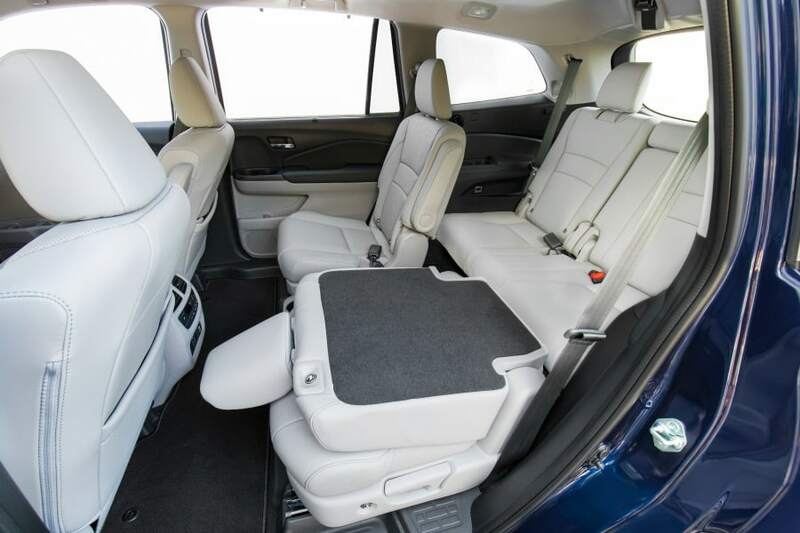 The individual heated captain’s chairs in the second row of the Elite model eliminate backseat fights and give the kids a sense of independence. This option does, though, reduce the total seating capacity to 7 from 8 with a bench. The one-touch second-row folding seats in the Elite model make access to the third row so easy your toddler can do it. (Because they need to help somehow). The second row provides great charging capabilities along with HDMI input and regular plug. Whilst lacking a USB charging port, the third row is spacious, and even with the third-row seats in place, there is still 16.5 cubic feet of cargo space behind them. Epic. 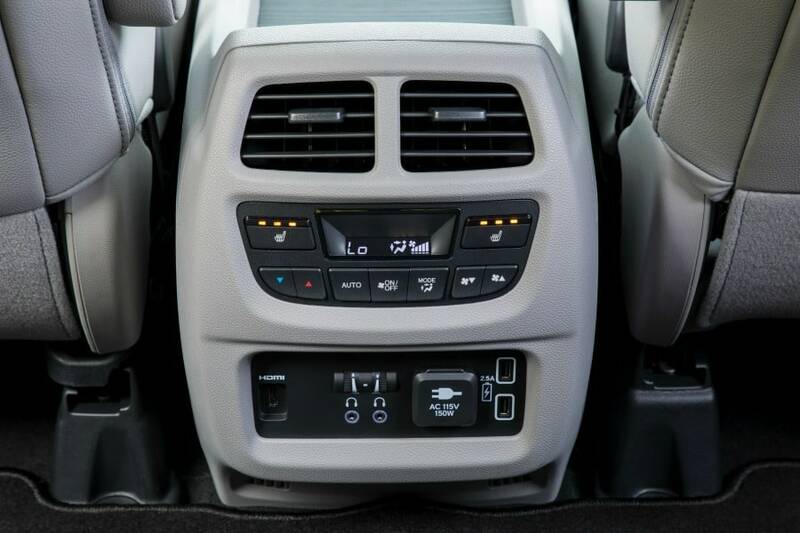 There’s also a cargo storage compartment in the trunk in which to store your shoe collection or stinky sports gear. 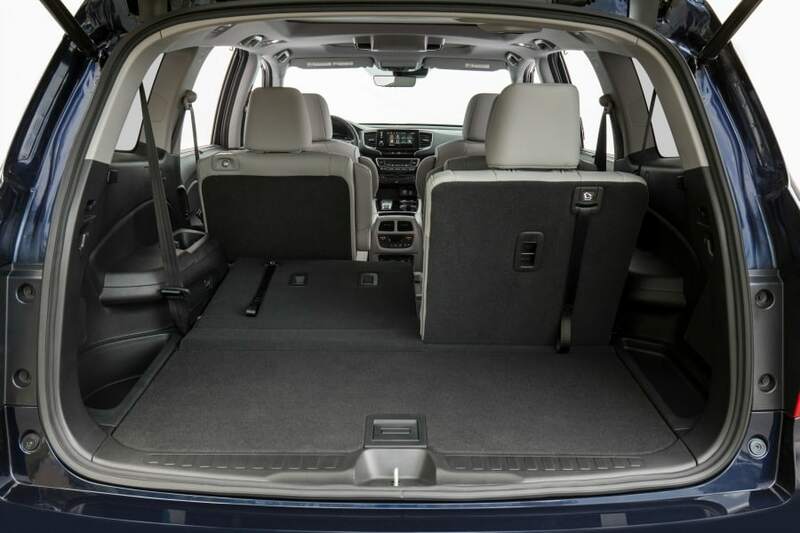 The Pilot employs the hands-free power tailgate as an option, so if you have the key in your purse, you can come up to the rear hatch and swing your foot under the rear bumper to open or close it. Whilst carrying a kid and 7 bags of groceries. This is winning. After riots broke out and Honda owners took time off work to mount extensive protests, the engineers decided to bring back the volume control knob. (It had been controlled on a touch screen and everyone and their grandmother thought this to be sacrilege.) The eight-inch infotainment screen found in all trim levels, except for the base LX model, is only slightly smaller than an iPad and of all the vehicles I have driven it was the most perfect in size. I drove the Elite model that featured a wireless smartphone charging pad and onboard Wi-Fi. 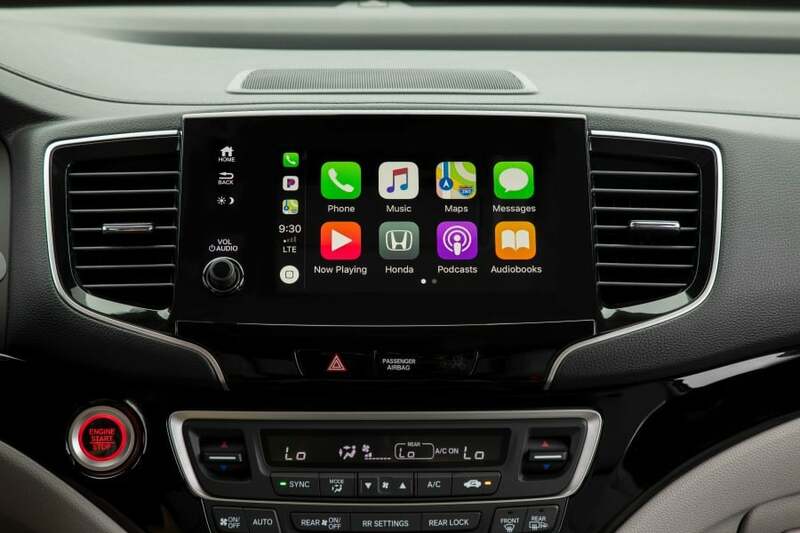 On EX and above trims, you can rock out to Apple CarPlay and Android Auto, and get treated to Honda’s new infotainment system, which includes CabinControl and CabinTalk. CabinControl is an app that allows passengers to control the Pilot’s audio system, rear entertainment system and rear climate control system. 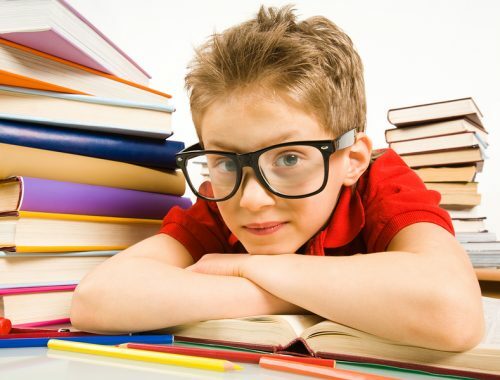 The app also offers Social Playlist, so that everyone can contribute to the music selections. A passenger can send a specific address directly to the vehicle using their smartphone, but I found this to be unnecessary because the navigation system in the Pilot was so easy to use. With CabinTalk (EX-L and above), the driver can talk to backseat passengers through speakers or even while they are watching a movie into the wireless headphones. As a driver, this can get highly entertaining when the kids are engrossed in a movie and suddenly they hear your voice. To the parents out there, I also want to note that ‘Are We There Yet’, which first appeared on the Odyssey has become part of this vehicle as well. 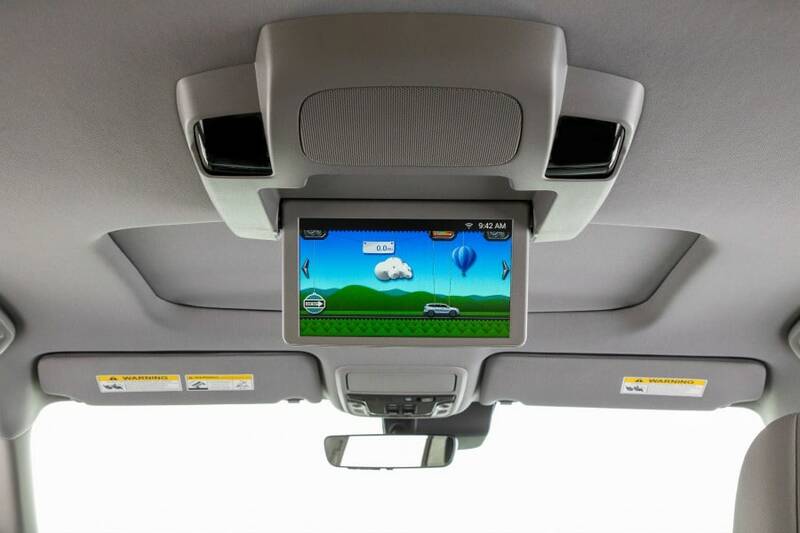 It’s a fabulous cartoon-like screen on the TV that shows your little ones how much father you need to drive. This is the most noticeable area where Honda has tweaked and greatly improved the vehicle. Honda was very cognizant that the aggressive performance of previous Pilot models did not match the look. They developed a new front fascia featuring a skid garnish and standard LED low-beam headlights. The rear features new taillights and a new bumper. The chrome accents made the vehicle look far more expensive than it is. Pilot Elite models receive power folding mirrors with automatic dimming and available LED fog lights. You can also get a graphics package in silver, red, orange and blue for $350, which includes decals for the centre of the hood, wheels and sides. It doesn’t quite have ‘soccer mom’ written all over it, but this option makes the Pilot versatile for many demographics. The highlight of my drive was an off-road course set up with hills, river rocks, mounds, sand and gravel. The Pilot is equipped with torque vectoring control, so the system can send up to 70% of the power to the rear wheels and from there, and specify 100% of that power to either the right or left wheel individually. And the traction control system is simple for the driver, which a quick mode selection. Depending on whether you are in snow, mud, sand or on a normal road, the system will adjust and optimize the Pilot for the road conditions. Several times I thought I would flip, and I even had two wheels off the ground at a time. I tilted the vehicle on a 33-degree angle, and then even backed up a very steep incline with ease. There are 7.3 inches of clearance, so you can totally head to ballet class on the back roads and make your commute a bit more fun. One challenge for my family is that school drop-off is on a hill, and other vehicles come right up to my bumper. I use the parking brake and accelerate to avoid rolling backward and tension fills my body every time, twice a day. With the Pilot, you can take your foot off the gas for 3 seconds without fear of reversing on a very steep hill. Lifechanging for me. Personal challenge accepted. I got a chance to tow a Civic Si race car that weighed 2,700 pounds on a 1,200-pound trailer. Not only did it feel as if I had nothing behind me, but even on hills I hardly felt the Pilot breaking a sweat. Pilots with front-wheel drive can tow up to 3,500 pounds, but those with AWD can tow 5,000 pounds. My preferred model was the Elite, with a total of $49,015, including all options and $995 destination fee. Though far less expensive, the entry-level LX trim just doesn’t have all of the bells and whistles our family would need. The most popular trim level is the EX-L and is priced at $42,655 when equipped with all-wheel drive, navigation, and the rear entertainment system. Giving this vehicle a thorough test not only proved to me the power of the engine, but helped me define the needs of my own family. It also made me want to start off-roading and towing a whole lot more regularly! *Prices quoted are in USD. 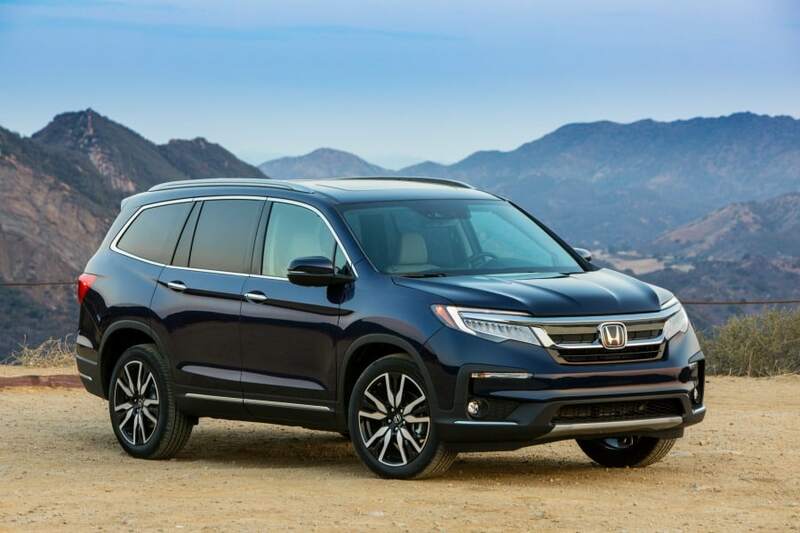 Disclosure: I was hosted in California to test the 2019 Honda Pilot. All opinions and driving impressions are my own.